Angular acceleration calculator helps you find the angular acceleration of an object that rotates or moves around a circle. As you will soon see, the angular acceleration formula differs from the acceleration in linear motion, which you probably know very well. Read on if you want to learn what are the angular acceleration units and what is the angular acceleration equation. You will find out that you can compute it with our angular acceleration calculator in two different ways. You can also check our centrifugal force calculator, which is dedicated to the circular motion too. The rotational movement of an object is usually described by a physical quantity called angular velocity. It measures the angle by which an object has rotated in a specific time. For example, imagine that a carousel in an amusement park performs full rotation within ten seconds. Its angular velocity is one rotation (360°) per ten second or 36° per second. Let's assume that our carousel starts to rotate faster and faster, not 36° but 50°, then 64° per second. The angular acceleration describes this rate of change of angular velocity and is caused by torque. R is the radius of the circle (or the distance from an axis of rotation). Tangential acceleration acts as a linear acceleration, which is perpendicular to the radius of the circle. the most common is units of angle per second squared (e.g. rad/s², °/s²). This unit illustrates well the meaning of the angular acceleration since the linear acceleration is expressed in m/s² or ft/s². sometimes we omit numerator leaving only the 1/s². because angular velocity can be expressed in hertz Hz = 1/s, we can also use this in angular acceleration receiving Hz/s. We have used this convention in our angular acceleration calculator. The conversion between the above angular acceleration units is as follows rad/s² = 1/s² = Hz/s. You can check our angle conversion calculator too! 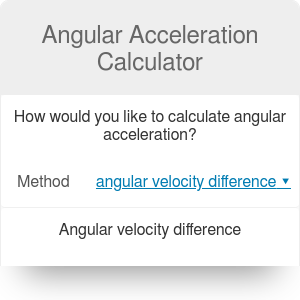 Angular Acceleration Calculator can be embedded on your website to enrich the content you wrote and make it easier for your visitors to understand your message.